Thought so. 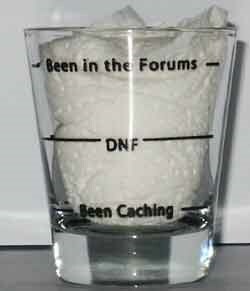 I had a picture from the Fisur site that didn't match the 2003 or 2005 so I thought there just might have been another version out there. Does anyone have an extra Missouri geocoin they'd like to part with? I've got Oregon, California, Pennsylvania, Washington, GOWT, Conejo Cachers I can trade. That the old or the new Conejo Cachers? I'm not sure if it's the new or old one but it's the 2004 coin. 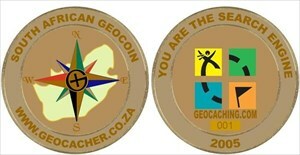 I saw your geocoin page and that's a mighty impressive collection! Since the forum apparently has the edit time-limit option set, I have to make a new post to update the coins I have, sorry 'bout that. Again I'm looking to trade for coins I don't have. contact me if interested. The coins I have are: 2003 USA, 2004 USA, Canada, Oregon, Washington, California, Pennsylvania, North Carolina, MIGO, GOWT, Conejo, ckayaks, vacman, Waypoint 15, Green Man, Joy of Geocaching. Coins I have available for trade are: California, Conejo, Washington, GOWT, ckayaks, vacman, North Carolina. I am looking to trade! When I grow up I want to be just like NurseDave! WOW! What a collection. I ain't picky though. I only want one of every Geocoin out there from everywhere. Yeah, Nurse Dave has an impressive collection! Thanks for the idea on photographing signature items found. I think I may do that. Note: These GA coins probably won't make it to outside sales at all considering how many are already prepaid for and the fact we have an event next week, where I anticipate the rest will sell out. Email sent. I have Washington and Michigan too if you don't want what I suggested. I have extra of these coins available for trade. If you need one of these and want to trade, let me know. I also have these coins so don't need to trade for them, but will trade for any others. Just saw a picture of the coin I am looking for. Same as the 2003, but with a large round "LoneStar" version of the Groundspeak logo on the back, instead of the standard square logo and URL. I've made trade arrangements for the PA coin and ND's personal geocoin, thanks guys! I've decided that because I collect signature items that I'm really more interested in trading for other cacher's personal geocoins. I'm done trading for now, but once I get these in hand in 3-4 weeks, I'll definitely be posting again looking for other personal geocoins. I have a few Washington State Geocoins that I'm looking to trade for State Geocoins I don't have. 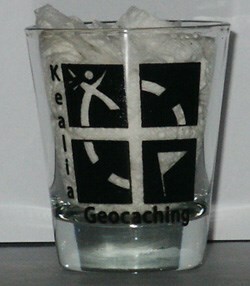 I will be getting the new GA Geocoin soon and would like to trade for other states. WA would be great! 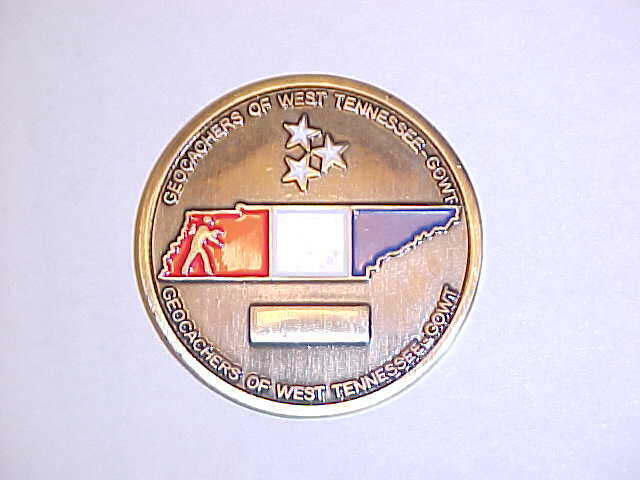 I still have 5 unregistered (and now sold out ) West Tennessee coins I'll trade for any coin except Washington State, Oregon, and Alabama (already have those), and I'll still trade or buy any coin number 357.
i've only managed to happen across 1 canada geocoin so far, and i actually released it back in the wild!! i would be willing to buy any area coin with "23" on it. just that, not at the end of a number. i'm still trying to figure out where to get wooden nickels made up. i have a moun10bike and cav scout wooden nickel available. please pm or email me if you've got a 23 coin! ahh yes, kilted one ... but do you have a georgia geo coin??? I'm a little confused as to why you're hyping the Geogia coin so much when at least for now it seems like you're not going to order enough to met demand. we are selling them to local georgia cachers first ... after the meeting on saturday, if there are any coins left, we will then offer them to cachers outside georgia. if the demand is huge, we will take orders and then make another run. hope that clears up things. Well you're getting one. Isn't that all that matters? I'll have around 10 of the Georgia Geocoins for trade when they come in. I'll be looking to trade them for other State and Personal Geocoins, especially Texas, and 2003 or older Geocoins. Thanks! BTW, this is unsolicited testimony. I traded a few coins to Worker of Wood for some of the wands. They are pretty cool. My son and the neighbor kid have been playing Harry Potter with them all weekend. Does anyone have one of these to trade? Brand new to the game and have no coins for trade, would anybody be interested in letting me make a purchase? The Calgary Coins are due in in about 6 weeks time, still accepting orders. See other thread, or PM me for details. Email with offers - thanks! and Georgia on the way. We hope you like our effort. Edit: Should've noted that I already have some Calgary geocoins on order, but have an extra Trez's Pirate Treasure, Trez's Aztec Gold and possibly a Conejo Cachers coin to trade as well. I still have two Washington State geocoins for trade. I don't have any extra coins to trade, but I want a North Carolina coin and I want a GOWT coin. So if you have one, we'll discuss a deal. I have around 10 of the Georgia Geocoins for trade. I'm looking to trade them for other State and Personal Geocoins, especially Texas, and 2003 or older Geocoins. I already have a trade set up for Washington, e-mail me if interested and Thanks! Hey we have a small country! Only the size of Texas! I never knew there will be such a "market" for the coins! If I get enough inquiries I will see if KVcoins can up the amount to 200! I want one! How much? what is a GOWT coin? I would think you could sell around 50-100 just to us California cachers. Geocachers Of West Tennessee - Spencersb posted a picture early in this very thread. If I get enough inquiries I will see if KVcoins can up the amount to 200! I would take 1 for sure. How much? I'd take 10 of the South African coins too! Ya 10 here too. Just don't sell any to workerofwood, okay? We have a few GA smashed penny geocoins that we would trade for, the only geocoin we have is Calafornia. Would love to collect other's, at some point.